Green cleaning is so popular. Every blogger is posting their "totally ah-may-zinggg" homemade cleaner recipe that involves three magical ingredients, such as castile soap, vinegar and baking soda. All of this all sounds awesome, until you actually try the recipe yourself. Then you wonder what that blogger's standards of cleanliness actually are. Amiright? Since I've been publish articles on green cleaning several times a month, for almost three years now, I have tried a lot of green cleaning recipes and techniques. I have come to one conclusion: If I were stuck on a desert island with two cleaning products, they would be bleach and dish soap. I would also want rags, an empty spray bottle, water and a bucket, and a good scrub brush. Not vinegar, not baking soda, and definitely not lemon juice. But hey, I hear you if you won't use bleach in your house. It's not for everybody. So let's get to my green cleaning tips. Don't clean with lemon juice: In my experience, lemon juice leaves a sticky residue on surfaces. It is, after all, juice. Though it is touted to be a grease-cutter, I find that it does not cut through grease. I have used lemon juice to clean both diluted and neat, and I've always been disappointed with the results. As an alternative, I recommend cleaning with a dish soap and water solution and a scrub brush. Dish soap and water solution, even the ecologically-friendly kind, cuts grease way better than lemon juice. Combined with a brush and elbow grease, it is a very effective cleanser for greasy kitchen appliances. The trick is to do two passes on the surface with it, and wipe with rags after each pass. 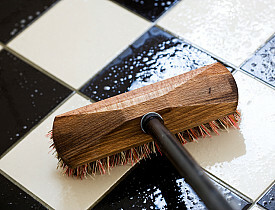 Dish soap and water are actually one of the best tile floor cleansers I've used. Water down the vinegar: Straight vinegar doesn't clean more effectively than a vinegar and water solution. Vinegar neat is super-smelly, and hard on skin. It also leaves a residue on glass surfaces, in my experience. Water it down for best results. I like a 6 parts water to 1 part vinegar ratio, but try different strengths of concentration for yourself. Also, flooring contractors agree that straight vinegar is very harmful to hardwood floor finishes, so never use it straight to clean a hardwood floor. Read 8 Ways Not to Use Vinegar. Rinse baking soda off with water: Who has ever tried using baking soda as a scrubbing cleanser, only to be left with a residue on the surface you cleaned? The trick to using baking soda as an abrasive cleanser is to wipe it off with rags, then spray the surface down with water, and wipe with rags again. Use plain castile soap for laundry instead of putting it in a DIY laundry detergent: A few months ago, I made my own laundry detergent and was so excited. It contained castile soap, but in a much smaller proportion than washing soda, baking soda, and Borax. It turned out not to really work unless I squirted a whole lot of castile soap into the wash with it. Then I ran out of my DIY laundry detergent, and used just castile soap to do the wash. Guess what. It cleaned better than the DIY laundry detergent did. It helps to add vinegar to the rinse cycle to wash the soapy residue off the your clothes (not at the beginning of the wash, or you will counteract the castile soap). I am also sure that my NYC plumber is glad that I am not rinsing undissolved detergent solids down the drain anymore. Do you have green cleaning tips? What works best for you? Please comment.